Everywhere you look, restaurants are continuing to expand their craft beer selections, putting pairings on the menu and giving brews equal, if not more weight, than wine and cocktails. But The Brewer's Table, a new restaurant-brewery concept in Austin, is taking a deep-seated love of beer to the next level. In the two years leading up to the opening, Hunter and Durish spent time learning each other’s crafts and collaborating on a series of pop-up dinners, which they executed locally and took on the road to destinations like Brooklyn Brewery and New Belgium. The resulting food and beer menus not only inform each other as they evolve with the season’s bounty, but they cross-utilize ingredients in an effort to remain as sustainable as possible. Brewing by-products get a new life in a number of innovative ways, showing up in composed dishes as saison marmalade, hop leaf harissa, yeast pickles, barley boudin, beer-brined kraut, black beer vinegar and beer grain falafel and spaetzle. 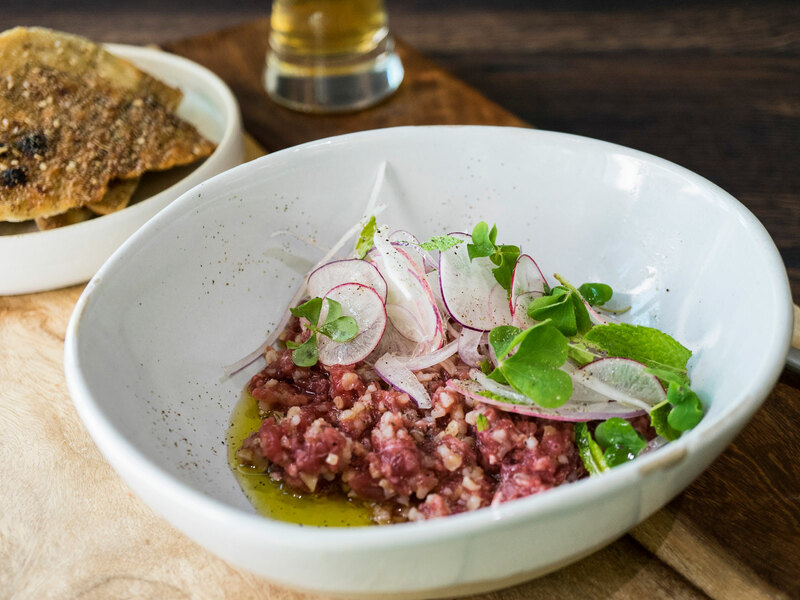 Hops are mixed with salt and sugar to cure fish and toasted yeast is sprinkled atop bites like beet pastrami and venison tartare. One dessert manages to pack all the elements of brewing into a tiny beer grain waffle cone topped with toasted barley ice cream, yeast caramel, hop honey and hop salt. Upon seeing the quantity of spent grain he had to work with, Hunter began drying and pulverizing it into a flour. He then realized the same grains could be used in a variation of a Japanese technique called nukazuke, whereby vegetables are fermented using rice bran, water, beer and salt. The space above the cellar room has transformed into a larder for preserving ingredients for future use, whether that means aging a whole smoked fish carcass or drying excess herbs and botanicals. 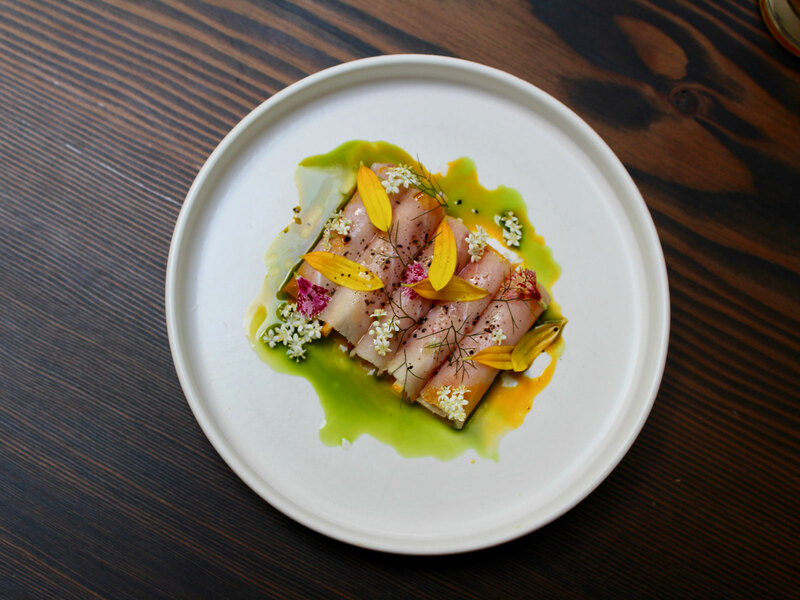 Every hot dish served in the restaurant is either grilled, smoked or sautéed using a custom 7-foot wood-fired grill, and Hunter has even developed a method of using the resulting ashes to nixtimilize corn for housemade masa. In a climate-controlled cellar room visible from the dining room through wide windows, Durish’s house lagers (which the team has affectionately dubbed Drew’s Brews) are fermented in American oak foeders. The varying toast levels of each barrel, which were custom-made by Foeder Crafters of America in St. Louis, contribute tannins and tasting notes like vanilla, coffee and caramel to each brew. Durish also plans on experimenting with aging, blending and seasoning the beers with different types of wood as the oak foeders mellow out over time. Of the six house lagers, at least three at a time will always contain a culinary element, utilizing scraps and byproducts from the kitchen. Currently on draught is Idee Fixe, a dark lager made with black tea leaves and lemons; Transatlantic Flourish, an IPL-style brew made with dried jasmine flowers and wilted edible flowers leftover from table centerpieces; Beets by Drew, which utilizes beechwood-smoked barley, roasted beets and several varieties of mint; and Baltic Hash, a porter made with roasted sweet potatoes, mesquite pod syrup and grapefruit zest. Next on the horizon is Made in the Nightshade, a hoppy lager made with green tomatoes and dry-hopped with Citra and basil, and Sleeptime Lager Bier, a brew steeped with chamomile, honey malt and preserved lemons. In addition to house beers, the drink menu offes 26 guest beers, plus wine and spirits. A seasonal cocktail menu nods to the art of the brew with ingredients like saison chamomile syrup and hop honey, and the bar team also strives for zero waste, incorporating ingredients like grilled banana syrup and peach preserves into drinks.